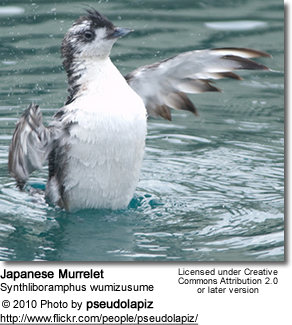 The Japanese Murrelet, Synthliboramphus wumizusume also known as Crested Murrelet is a small bird that inhabits rocky islets and reefs in the warm waters of Japan, Russia and South Korea. It has black and bluish grey upper body and white underparts plumage. Breeding sites are crevices, burrows and hollows in rocks, the gaps in piles of stones, and among grasses on uninhabited islands. The northern limit of the breeding sites are the Nanatsujima Islands of Japan, while the most important breeding sites are Biro Island and the Izu Islands. 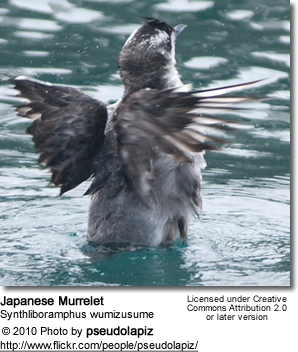 The Japanese Murrelet lays eggs in March. Clutch size is slightly less than two eggs. Incubation duty was shared almost equally by both parents. The chicks are not fed in the nest, but leave the nest one to two nights after hatching. 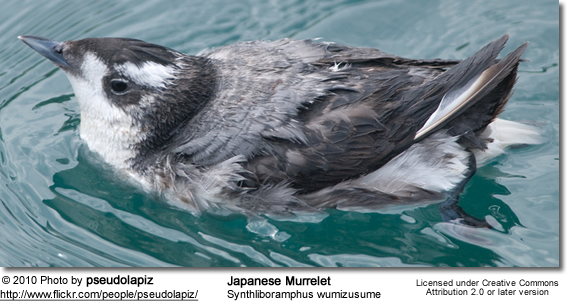 In 1975, this species was designated a natural treasure by Japanese government. 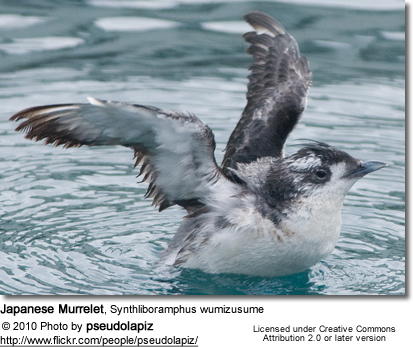 Habitat disturbance due to increasing sport fishing activities, predation by crows, large gulls and rats among others, gives the Japanese Murrelet its Vulnerable status on IUCN Red List of Threatened Species. It is listed on Appendix I of CITES and legally protected in Japan.